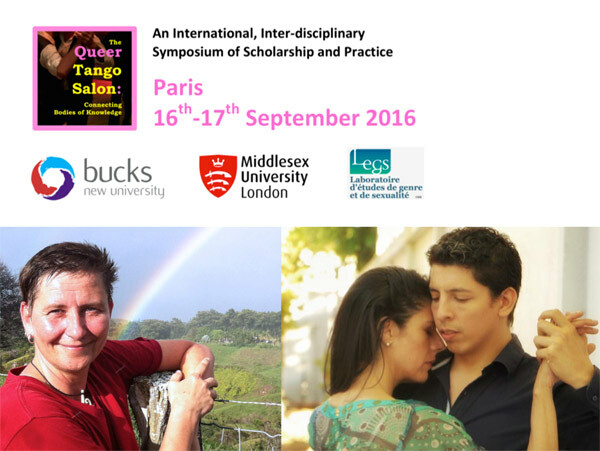 Join Ray Batchelor, Hélène Marquié and Jon Mulholland in Paris for The Queer Tango Salon: Connecting Bodies of Knowledge – an International Inter-disciplinary Symposium of Scholarship and Practice on September 16-17, 2016. Access is free! For two days, The Queer Tango Salon will bring together for the first time in the history of Queer Tango, Queer Tango activists known for EMBODIED KNOWLEDGE and academics with reputations for INTELLECTUAL KNOWLEDGE into the same space to talk, to listen and to dance. Astrid Weiske and Gaston Enrique Olguin (dancers and teachers) join with Kathy Davis and Erin Manning (academics and authors) to make Keynote Contributions. If dance is embodied knowledge, what special insights into gender relations, into LGBT and queer politics, and into the minefield of physical intimacy can Queer Tango bring? What do we find out by dancing Queer Tango? To whom might our insights matter? If you find questions like these interesting, and think you might like to run a dance workshop or present a paper to try to answer them, we’d like to hear from you! To increase accessibility and out of respect for our French academic colleagues, we have decided NOT to charge for this event. Unlike in the UK, not charging is the norm in France even for important events like this. You’ll still need to get there and find accommodation. We will have suggestions for both. So, what is your idea? Why not let us know..? Our call for papers/interventions is now open. The deadline is May 1, 2016. Please share these links with anyone else you think might be interested!